practically all the elements of the periodic table find use in the modern electronic industry. Non-metals like sulphur hold on tightly to their electrons and so are good insulators; metals like copper do just the opposite and are good conductors. Elements like silicon come in between and make themselves useful as semiconductors. The exception is graphite, a form of carbon. Although a non-metal, it conducts electricity. With slight variations in its form, it can oscillate between being a conductor and an insulator. In 2004, a team of researchers derived graphene from graphite and like graphite this too came out as an excellent conductor. When the same teammodified graphene to increase its applications, it got graphane. The new material ceased to be a conductor because it turned out to have insulating properties.This ability of graphite to exhibit split personalities has manifold applications, said the researchers. Graphene is the thinnest material capable of conducting electricity; it consists of a one-atom thick layer of carbon molecules and was expected to replace silicon in electronics. It failed because it was not possible to control the flow of electrons in a graphene chip, causing an enormous amount of energy to be wasted. Researchers have sought ways to tame graphene. The team from the University of Manchester added hydrogen atoms to each of the carbon atoms in the graphene's one-atom-thick construction. Earlier experiments to do this failed as the process of breaking hydrogen molecules into atoms requires a lot of energy. The high temperature damages graphene's structure. The team took care of this problem by exposing graphene, from a distance, to a discharge of hydrogen gas disassociating into ions. "The work is the first to show that a chemical approach can be used to tailor the properties of a nano-material like graphene to tune it to a particular application," said Andre Geim, part of the team at the University of Manchester. The results have been published in the January 30 issue of Science. Studies on the electrical and structural properties of graphane revealed that hydrogenation alternately bound hydrogen atoms on both sides of graphene's carbon plane. This created a hexagonal arrangement resembling a diamond crystal structure and like diamond, graphane ended up as an insulator. It had tamed good conductor graphene's unruly electrons. Graphene's conducting properties makes it a good ingredient for superfast nano-scale transistors. But it has a flat, plain structure and so its electrons flow without any hindrance. When graphene is hydrogenated to form graphane, the structure does not remain flat anymore thus bringing about the much needed control in the electron flow. "The insulating properties of graphane would allow us to combine the excellent transport properties of graphene, channelled and supported by graphane," said Jorge Sofo, the Penn State University researcher who had proposed the possibility of graphane in 2007. Currently, a combination of materials like silicon and carbon are used to fabricate different parts of an electronic chip. 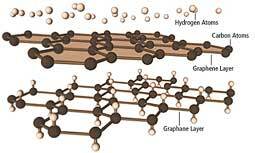 A graphene chip modified chemically to form graphane would remove that need. "All this without interrupting the basic carbon backbone," explained Sofo. Addition of hydrogen to graphene would also allow its use for fuel storage. "The structure of the theoretically predicted graphane has one hydrogen atom per carbon atom", said Nihar Ranjan Ray, professor at Saha Institute of Nuclear Physics, Kolkata. Put a few strips of graphene together and get a fuel storehouse. Graphane has its sceptics though. "The process does not have practical applications," said Walt de Heer of the School of Physics at Georgia Institute of Technology, usa. He said Manchester University's research is a variation of a process his group had employed for the same reason and with similar results. "We have applied for a patent for the process," he said.